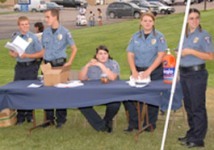 explore and discover career opportunities available to them in the law enforcement profession. are still active in training and assisting our current post members. You will also be encouraged to participate in ride-a-longs with officers during their shifts. To begin exploring, pick up an application at the Sheridan Police Department. For more information, contact Sergeant Ostby at 303-438-3257.